Snrky: Idiot. In that context jam means to fit as much as possible into the project. Idiot. In that context jam means to fit as much as possible into the project. Excellent. I get to link to Hussman. He might be the source of that jargon in the parts I frequent. So while I'm fond of his methods, I'm not fond of that particular bit of jargon. It implies we're not actively creating stories all the time. That there's a special time for it story creation. And while I understand the benefits to isolating yourself in a space and really getting down to brace tacks, I think there's even more benefit when people learn to think agilely no matter where they are and no matter what the interruption might be. If you can flush out a story on the spot. If you're thinking in terms of stories and how your work is a story all the time. Then you're going to save yourself a lot of tear up, tear down, and repeat situations in various meetings. Hold “story jams” to create the stories (think like music jams – let the creativity flow). Use a long table and invite lots of people. Create personas, and walk through a day in their lives. The list of stories doesn’t need to be complete after the story jam. Snrky: They said to start a story jam. I stomped on the grapes, but all I got was story wine. Title: Idiot. 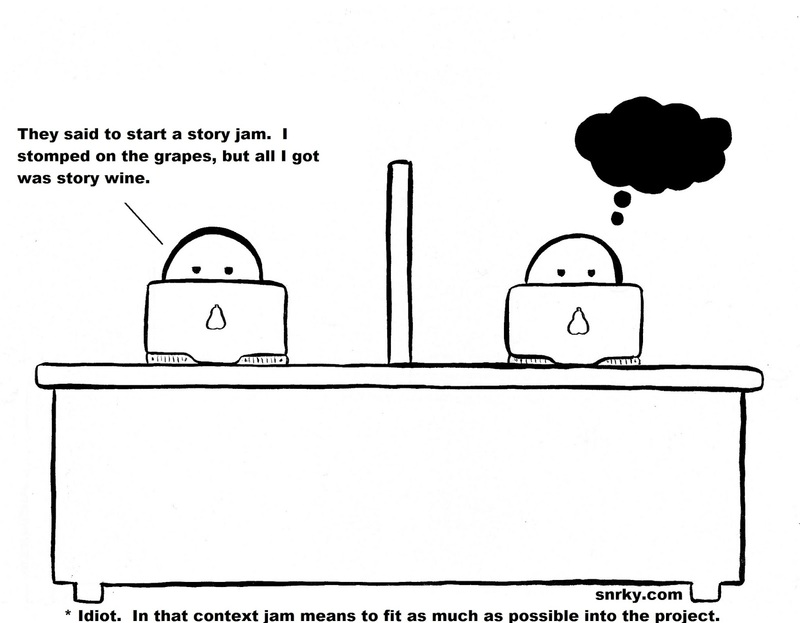 In that context jam means to fit as much as possible into the project.